The entrance to the property has an enormous Coat of Arms of the family in stone, a sign of past times. This delightful villa was recently restored and is situated in the grounds of the Manor House Casa de Cocheca, on a beautiful estate in the Douro Valley, in North Portugal. The property overlooks a small farming valley in which a tributary of the River Douro flows. Casa da Porta is a two storey house which is air conditioned and has four bedrooms. All the bedrooms have a safe. On the upper floor there is one twin and one double bedroom sharing a bathroom and a comfortably furnished living room. There is Satellite television and a music centre. The large, traditional kitchen is equipped with an electric oven, dishwasher, washing machine, grill, microwave, fridge with freezer, toaster and coffee machine. On the lower floor there is one double and one twin bedroom both with ensuite bathroom. There is also another living room. All rooms are well decorated in typical Portuguese style and are air conditioned. The "Azenha", an old mill-house in which olives were pressed, and where the millstone was turned by oxen has been converted to a museum and an area for guests to socialize, with a bar, tables and games. Events can also be organized in this bar, which has seating for up to 40 persons. 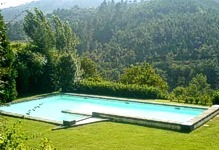 The property has a swimming pool, set in the lawned gardens, which is also used by guests staying at the Manor House. Outside there is parking for 2 cars. Nearest attractions to Casa da Porta at Casa de Cocheca include the Port Wine Lodges and the fascinating city of Porto. Also the beautiful town of Amarante in the Douro region. Opportunity shouldn't be missed to take one of the most fascinating train rides along the Douro Valley.